The most expensive piece of foam rubber in the world? 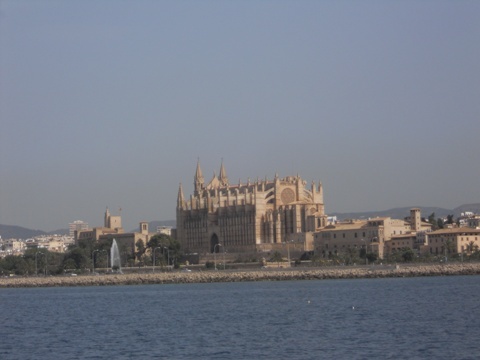 We left Port Adriano what seems like a long time ago, but was in fact Wednesday the 8th of August, and had a gentle sail round into Palma Bay. 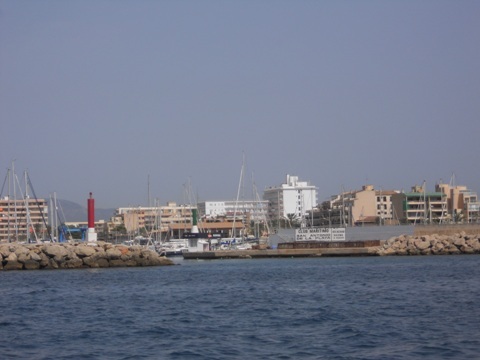 We were hoping to spend the night in Cala Portals, one which I remember from 2003, but on our arrival during the afternoon it was pretty crowded. 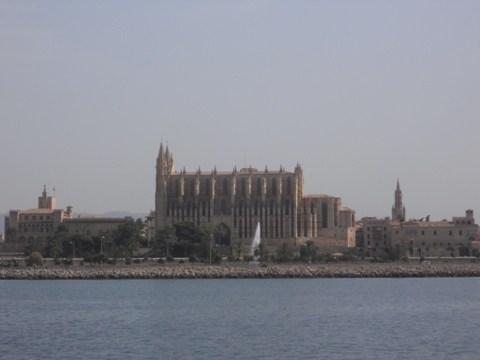 There was still room for us to anchor, but there was an unpleasant easterly swell rolling in, so we decided to continue to an anchorage behind Las Illetas. This was a good decision - it is a large, open anchorage and was completely sheltered from the swell by the island. We stayed two nights, and I mentioned that as it was so nice I wouldn't mind spending another night there. This turned out to be prophetic - on Friday morning, after a leisurely breakfast, we readied ourselves to leave, and when it came to weighing anchor Ann pressed the 'up' button and - nothing happened... "Have you switched the windlass off?" "No." A wiggle of the remote control wires produced a brief burst of action, but this turned out to be a red mullet. I spent the rest of the day fault finding and investigating online and concluded that it was in fact the Lofrans windlass control box, not the windlass itself or the wiring, that was not working - a quite common problem it seems. So we had no choice - we would be raising and lowering the anchor by hand for the foreseeable future. So after that little trip down memory sea, the wind obligingly came up and we were able to tack round Cabo Blanco and sail most of the way to an anchorage off the beach at Ensenada de la Rápita - a good choice again as there was plenty of room, the water was crystal clear and we could see sand, all good news when anchoring manually! 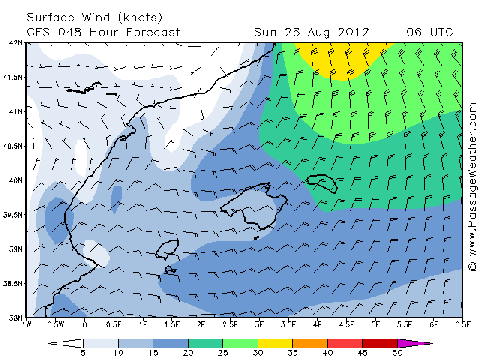 Although it was an open anchorage off a beach, there was very little swell and we had a comfortable night. 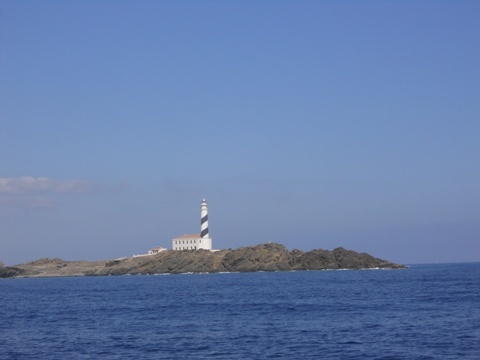 On Sunday we pressed on round Punta Salinas, from where we could see Isla de Cabrera. We had tried to book a buoy in the National Park there but it seems the charter companies block book them for the whole of August. A shame to have missed seeing the islands, but we would have been allowed to stay only one night even if there had been one available. 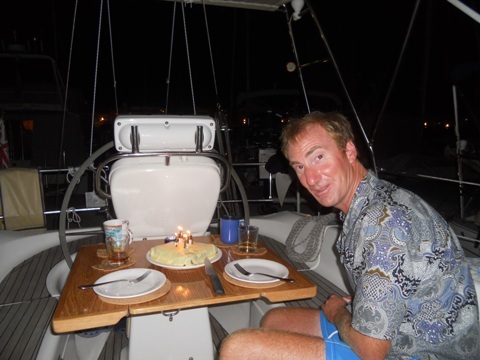 Talking of charter companies, we have been told that Neilson and Sunsail no longer operate out here and so it's generally not as busy as it was a few years ago. 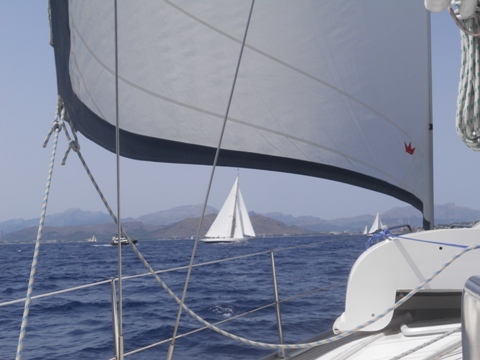 We have seen some charter boats, but not that many really and they seem to be from small companies or managed fleets. However, as we nosed into just about every cala between Punta Salinas and Porto Colom, we had our first real evidence of "the Balearics being so busy in August" - although some places have been busy, they have been no more so than say Salcombe or Fowey on a nice sunny August day, and not to the point of being unpleasantly crowded. However, we really couldn't find anywhere to anchor - some calas have room for only a couple of yachts, some have swimming buoys limiting the amount of available space and the larger ones were pretty full and given the windlass situation we didn't really want to be anchoring in too close quarters in case we had to get it up in a hurry. 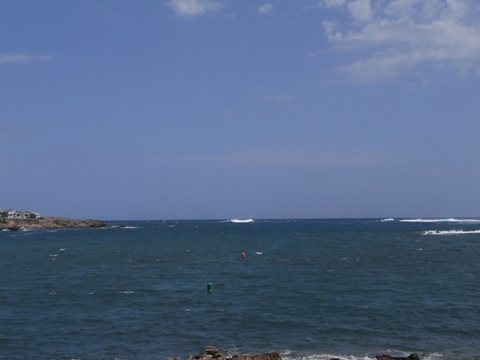 So eventually we picked up a buoy in Porto Colom harbour, a pretty place. We'd read numerous reports about the 'random' charging for these buoys, often no charge being made, but wouldn't you know it - just as we were about to have a late lunch, 'harbour boy' arrived in his RIB to relieve us of €23! We decided we'd try and find a spot in which to anchor, but after spending about an hour looking in the harbour and adjacent calas we returned to the buoy, and the boy returned to us for his €23! The next day we moved to the Port Authority pontoon which we had previously booked, for the weekly shopping, filling with water and other chores. One of these was to change the engine oil, which went smoothly enough despite the temperature being in the mid 30s, but in so doing I noticed two problems: the air filter had pretty much disintegrated, and the raw water hose from the strainer to the impeller had a worrying looking bulge in it where one of the reinforcing wires looked ready to burst out. We had read that there was a chandlery in Porto Colom, but not so. The office staff were helpful though and told us of a Volvo dealer a little way out of town. A phone call to Power Boats-Service revealed that they had both a filter & hose, so off I trudged out into the deserted countryside in the midday sun - how I laughed... 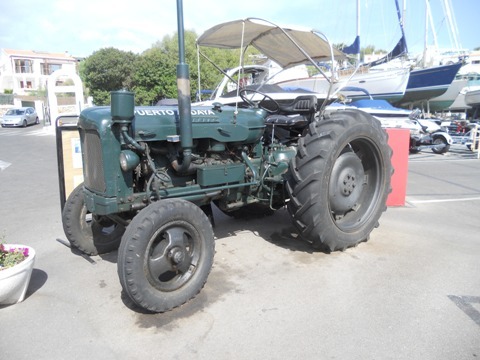 Anyway they were very helpful, and could even have sourced me a Lofrans windlass control box, but not the next day as it was a public holiday, so we would have had to stay two more nights in Porto Colom. So I declined their offer. 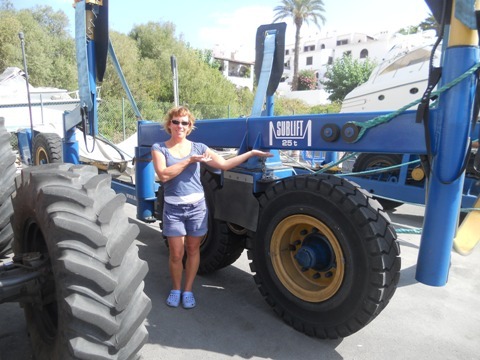 The water hose proved pleasingly easy to change, and was in a worse condition that first thought - there was a second area that had been chafing on the engine block and hidden from view, so it was lucky I spotted the other bulge. So how much is a Volvo air filter? €55 for a small piece of foam rubber. But what can you do when you're on the move all the time and don't have too long to source cheaper parts, even if they're available? I've heard it said that Volvo engines are reasonably priced when new, and then they charge outrageous amounts for spares and service items, particularly when pattern parts aren't available. We don't mind spending a little more on Volvo filters etc, but this is the first time we've fallen foul of this in such an extortionate way! 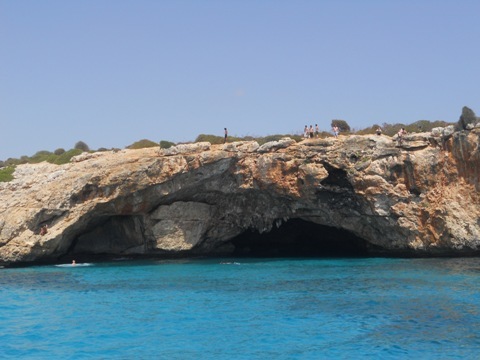 On Wednesday we headed north and found ourselves in Cala Barcas, a pretty cala with impressive sea caves along one side. 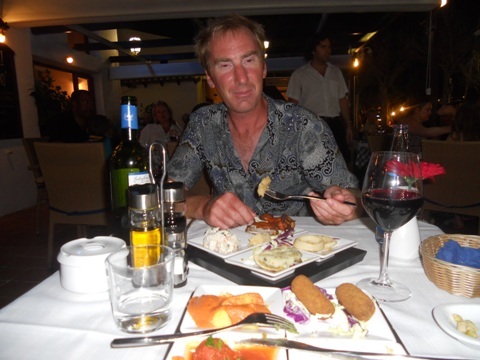 Our first night in Cala Barcas was calm, but the second was really unpleasant, making even cooking dinner very awkward! 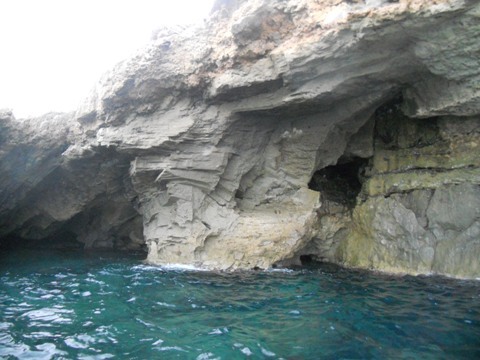 On Friday we nosed into Porto Cristo just to have a look. It would have been possible to anchor just outside the fairway, but there were lots of trip boats producing a fair amount of wash. We could have gone to the marina, but as we'd recently had two nights in a marina we decided to carry on. 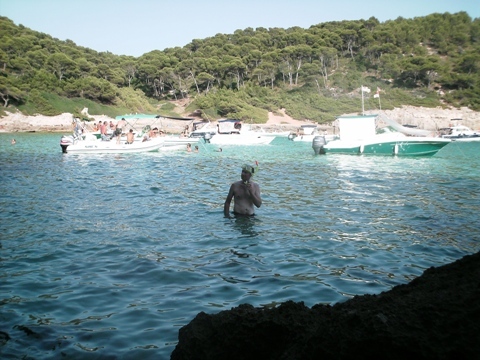 We moved north again to Cala Moltó which, despite being open to the east, seemed to be free of swell as it is tucked so far into a bay. There's a small stone beach there and some caves, but nothing else - over the rocky spit is another more developed cala, from where we were treated to some really quite good live music on the beach. 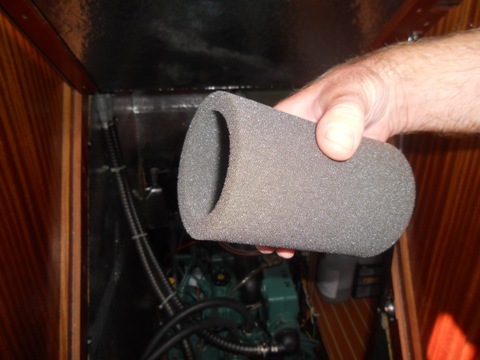 We also had a dongle signal, so were able to investigate getting the new windlass control box. 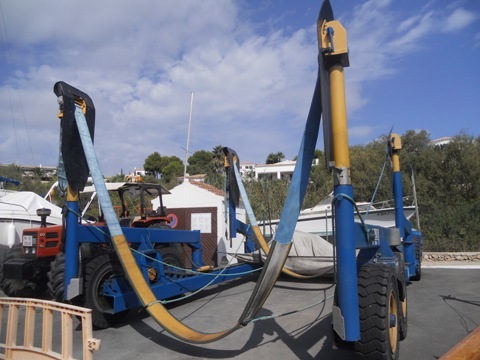 Of course nothing is ever straightforward - contrary to the photos on just about every online chandlery the new ones are different, both in dimensions and terminal layouts, so it's not going to be a simple case of one out & one in. As is so often the case with production boats Pipit appears to have been built around the control box, so access is difficult, and there is very little if any slack in the high current cables, so it remains to be seen if it is actually possible to fit the new box. Anyway Jimmy Green were very helpful and even emailed a technical drawing of the box, so they got the order! 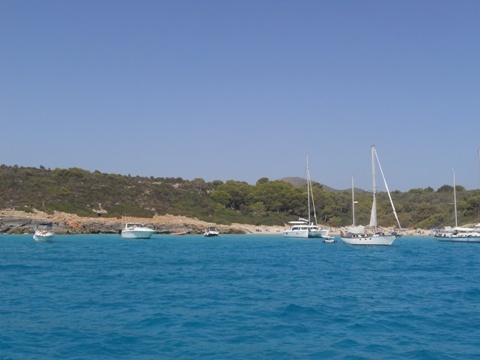 On Monday afternoon we returned south to Cala Moltó, our new favourite and an ideal departure point for crossing to Menorca, only 23 nautical miles away. 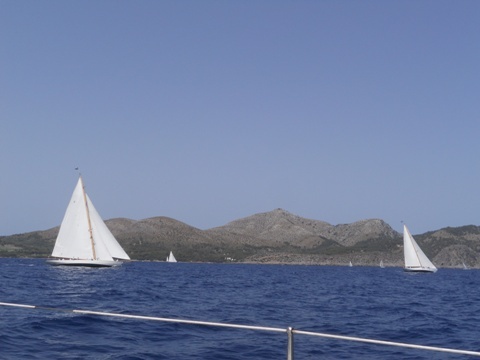 We have now 'tuned in' better to how the Spanish tend to use their boats: they come out in the late morning, so that by early afternoon the calas tend to fill up, but between about 1700 to 1900 most of them return to their marinas, freeing up space in anchorages. 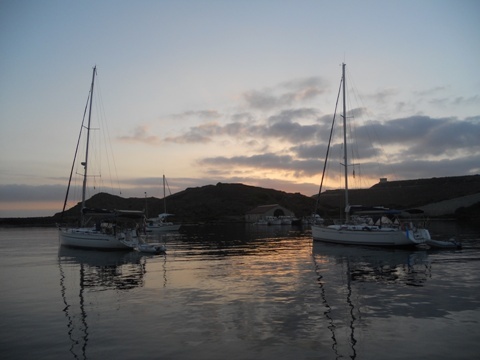 So, unlike most other places we've been where it pays to arrive early in order to maximise the chances of finding a good anchoring spot, it's often better to arrive in the early evening after the day sailors have returned home. 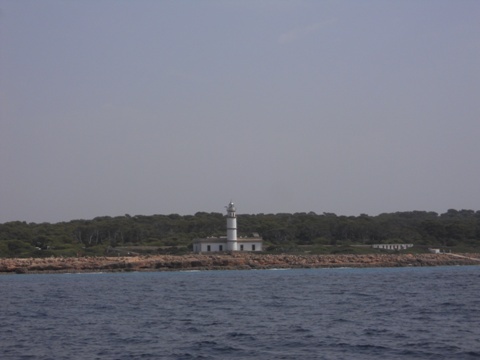 With the above information in mind, the following day we set off for Menorca sometime after lunch and had an uneventful crossing, some sailing and some motoring, anchoring in Cala Son Saura. 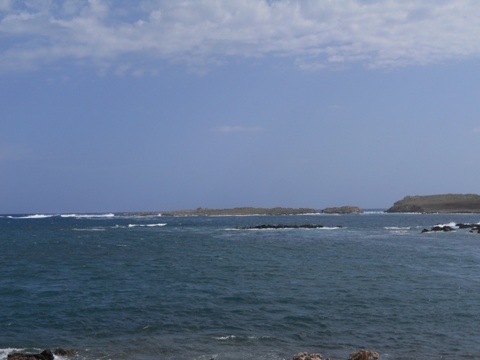 This was a good choice again, a large cala with turquoise water and plenty of visible sand. 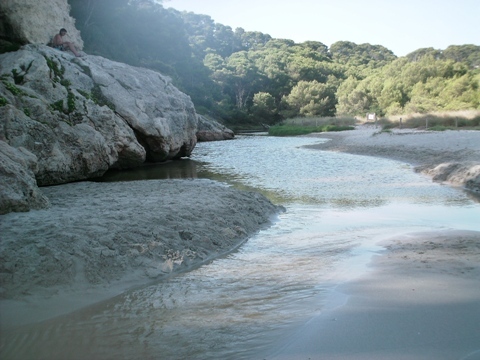 After a fairly roll free night we moved a short distance east to Cala Trebalújer, a very picturesque one with a sandy beach accessible only by boat or foot and a freshwater stream flowing into one corner. We swam and snorkelled and had a look at the sand bar over which we'd have to carry the dinghy in order to row upstream. We decided we'd do that the following day, but alas this wasn't to be - overnight a considerable swell developed, contrary to any forecast we'd seen, giving us a restless night and making assembling and launching the dinghy exceedingly difficult. This is a limiting factor of the Nestaway, one that is making us start to think again about an inflatable. However, we had noticed that the freshwater stream didn't seem that, well, fresh and appeared rather stagnant, so perhaps the August temperatures and lack of any recent rain had caused that. 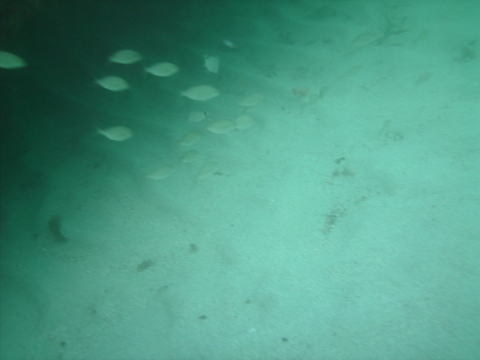 We also noticed that others who did disappear upstream soon returned, so perhaps we didn't miss too much after all. 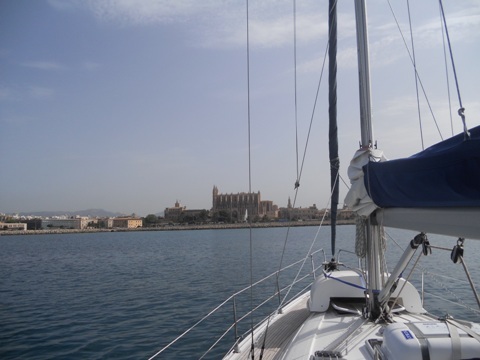 We suffered another slightly less rolly night in the hope that the swell would subside, but it didn't so on Friday we had a somewhat bumpy motor to round Punta Prima, after which we had a more pleasant sail to Cala Taulera, near Mahón. This was bliss, a large cala completely sheltered from all directions and hurrah! No swell! Straight out of the Gulf de Lyon. Here's why we are tucked up in Addaya - 24 hours ago the approach was flat calm! Note the breaking waves in relation to the fairway 'gate' buoys! 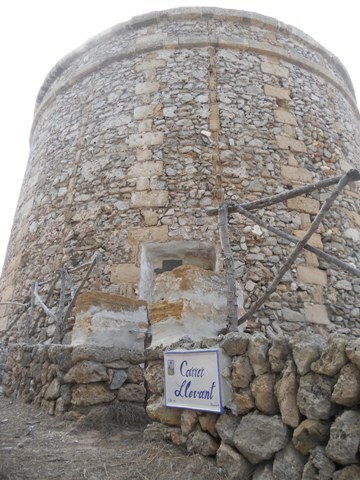 Cabo Favaritx lighthouse near Addaya. Sublift in Addaya marina - if you'd like one Jana on SY Scrabbler can sell you one! Tomorrow morning we hopefully have someone coming to climb the mast and investigate the wind instrument & anchor light problems, then we may anchor for a few days whilst waiting for the windlass control box to arrive and the 3 metre swell to subside. 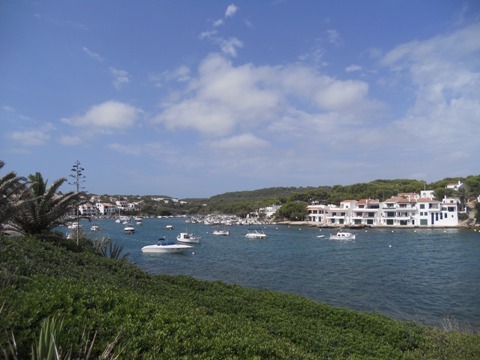 Later in the week we hope to go to Fornells before returning here to meet John & Maggie on Lazy Pelican, fellow Bavaria owners and magazine scribes, who are also headed Sardinia way.